According to Mozillazine, a major update to Firefox 1.5 was rolled out yesterday. "Users of Mozilla Firefox 1.5.0.12 have been offered a major update to Mozilla Firefox 2.0.0.4 via the automatic update notification. As reported earlier, Mozilla Firefox 1.5.0.12 is the last release from the Firefox 1.5 Branch. As per the the ReleaseRoadmap policy, the previous release of Firefox (1.5 in this case) is supported for six months beyond the release of a major revision (2.0 in this case). Mozilla Firefox 2.0.0.4 can also be downloaded directly from the Firefox Product Page." You have NOT received a postcard from a friend! See the report from SANS. Sunbelt researcher Adam Thomas discovered a custom trojan attempting to take advantage of the iPhone hype to sell a fake iPhone. Considering the interest in the iPhone, we shouldn't be surprised. The instigator of this trojan is bound to sucker a few folks in and will likely walk away with a full pocket. See the full details at SunbeltBLOG. At Kodak "A Nice Day for a Revolution"
After this weekend, two more Kodak buildings will no longer be standing, reducing Kodak Park from 212 to just 104 by year end. Today, a few minutes past 8:00 AM (EDT), Building 9 was imploded. Building 9 was the home for manufacturing photographic paper at Kodak for decades. As shown in the first picture, the 700,000+ square foot Building 9 was also visible from my 12th floor office window from the nearby Research complex. By the time I return to the office on Thursday, both the dust and remaining debris left from the implosion will be gone. Gone also are thousands of Kodak workers who were part of the traditional photographic business that George Eastman founded. What will not be gone, however, is the incredible spirit of those Kodak employees who are left to continue the evolution of Kodak to a digital company. “Not only about an evolution of the company, but also a revolution that Kodak continues to provide to consumers. You know, Eastman established low cost and easy photography for the masses and Kodak continues to provide that through our digital cameras and also through our new inkjet systems." Kodak easily illustrated the move to the future at the popular Consumer Electronics Show (CES), being awarded three CES Innovations Awards and also receiving prestigious honors from Popular Science and PC Magazine. I certainly understand why the KODAK EASYSHARE V610 Dual Lens Digital Camera that I recently purchased was named “Best of Innovations 2007” award winner in the Digital Imaging category. When it comes to printers, I cannot tell you how very pleased I am with my new Kodak EasyShare 5300 All-in-One Printer. I grew up in a "Kodak Family" with my grandmother, parents, aunts, uncles, cousins working at Kodak at one time or another over the years. Now I am the last of the family working at Kodak. With that background and family history, I did not think anything could be as good as Kodak 35mm prints for the consumer. The EasyShare printers with Kodak's Inkjet systems showed me how very wrong I was in this belief. Setting aside the low cost of the ink cartridges, the quality of photographic prints is absolutely awesome! Then consider that the color ink cartridge is only $14.99, black ink cartridge $9.99 or a package deal of $21.99 for both black and color ink cartridges! The only problem is that the EasyShare printers are selling as quickly as they can be made. Beyond quality, perhaps compatibility with both Windows Vista and Mac has added to the popularity of the printer. Improved image editing features like Panoramic stitch, histogram, and sharpen image. Improved tagging and organization including the ability to quickly sort by name, file type, tag or date. Publish photos directly to your photo galleries on Windows Live Spaces. Auto event grouping and tagging when importing photos (and video) from your camera to PC. As of now, the beta is only available to a limited group of beta testers as a "closed managed beta". The intention is to open the beta up for the public later this summer. For full details, see The Windows Experience Blog and Microsoft PressPass. As reported at the Windows Vista Team Blog today, the Windows Vista Family Discount Program is ending at the end of the month -- specifically 11:59 PM Pacific Time on 30 June 2007. That leaves just a couple of days if you are planning on taking advantage of the special offer. With the purchase of a retail boxed Windows Vista Ultimate, U.S. and Canadian customers can upgrade up to two additional PCs in your household to Windows Vista Home Premium for only $49.99 ($59.99 CAD) each. Details are available at "Bring Home the Wow". Microsoft, "Bring Home the Wow"
There were three KB Articles updated today, resulting in one important, and two recommended updates (depending on your version). The "Important" update relates to a revision to Daylight Saving Time. When I looked at the KB article, the change was merely designated as "June 26, 2007Added Windows Vista update information." Update for Windows Vista (KB931836) -- Installing this update enables your computer to automatically adjust the computer clock on the correct date in 2007 due to revised Daylight Saving Time laws in many countries. After you install this item, you may have to restart your computer. Update for .NET Framework 3.0: x86 (KB932471) -- This update addresses a Rights Management Services issue with the Microsoft XPS Viewer. You can restore full Rights Management functionality by installing this update. Cumulative Update for Media Center for Windows Vista (KB935652) -- This update addresses issues with Media Center for Microsoft Vista and applies to the 32- and 64-bit editions of Windows Vista Home Premium and Windows Vista Ultimate. For complete listing of issues included in this cumulative update, see KB935652. After you install this item, you may have to restart your computer. Microsoft updated Security Bulletin MS07-022 today. This bulletin relates to a vulnerability in Windows Kernel that could allow elevation of privilege. (KB 931784). The issue only affects NEC 98 systems with Windows 2000 Service Pack 4. Microsoft only provided new updates for the Japanese Language Windows 2000 NEC98 platform. No other updates are affected. For additional information see Microsoft Knowledge Base Article 931784 (http://support.microsoft.com/kb/931784). • Customers who have previously installed this update on NEC 98 machines running Japanese language Windows 2000 are encouraged follow the guidance provided in Microsoft Knowledge Base Article 931784 (http://support.microsoft.com/kb/931784) for reinstalling the update. • Customers who have not previously installed this update or are not affected because they do not have Japanese language Windows 2000 running on a NEC 98 system need take no action regarding this re-release. We strive to provide you with accurate information in static (this mail) and dynamic (web-based) content. Security Bulletins posted to the web are occasionally updated to reflect late-breaking information. If this results in an inconsistency between the information here and the information in the web-based Security Bulletin, the information in the web-based Security Bulletin is authoritative. If you have any questions, please contact 1-888HELPSEC (1-888-435-7732), select the option for Security Partners and provide your Access ID. "Getting to know the Microsoft enthusiasts" -- Me! I was contacted recently by the site owner of Vista4Beginners, asking if I would agree to an interview. Here it is: "Getting to know the Microsoft enthusiasts: Corrine Chorney - Microsoft MVP". After you read the interview, take some time to check out the site. You will be glad you did. There is a lot of helpful information, presented in a clear, concise manner -- and not just for "beginners". Enjoy! A lot has happened over the past year. In my personal life, there was loss early on and again recently. 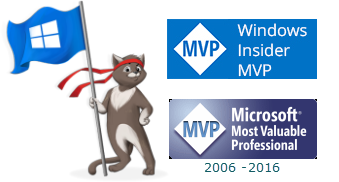 There was also happiness when "My Girl" became a teenager and when I was reawarded Microsoft MVP. Just when I needed it most, Bill Pytlovany made my day. The big excitement over the past year was caused by Microsoft with the release of Internet Explorer 7 and, of course, "The WOW" release of Office 2007 and Windows Vista. So, what is all the reminiscing for? Security Garden is one year old today. In celebration, I pushed the button to upgrade to the "new" Blogger. Except for some minor tweaks here and there, the "Construction Zone" here at Security Garden is just about cleaned up. With help from Blogcrowds, the conversion to three columns was fairly simple. I kept the same "Harbor" template but made some custom changes. Replacing the "lighthouse" gif accompanying each post with a mini-version of my rose avatar was a natural change. Removing the lighthouse from the background and some of the extra "foo-foo" seems to have lightened the load. Check out the new feature for accessing Windows Vista Bookmarks. Just click on the link in the sidebar to see the Table of Contents page. From there you can go directly to the page to access the bookmarks. Pretty slick! I am sure I will be making more changes along the way, but this is a good start. I hope you like the changes as much as I do. Security Garden is dedicated to my friend and mentor. "Due to diminishing support from Microsoft for Windows 98/ME, FRISK Software will only support the Windows 98/ME platform for a few more months and will discontinue support completely sometime later this year. This is slightly ahead of the previously announced schedule." In the meantime, FRISK has released a hotfix to address limitations encountered in Windows 98/ME. Get the hotfix. Refer to the Microsoft Support Lifecycle by Product for information on support for Microsoft operating systems and software. I have been working on a template revision for this blog off and on for a while. Although much of the work has been completed in a test blog, there is fine-tuning that is URL-specific. I expect that I will also change my mind on the location for bits and pieces and will be moving things around. Please bear with me as I make adjustments. Demo: What's new with the Windows desktop and Start menu? Demo: What's new with finding and organizing files? See Windows Vista Help Demos, added to Windows Vista Bookmarks in Features and Tutorials. There has been a lot written about UAC (User Account Control) in Windows Vista. I have read many forum posts and blog comments where users have claimed UAC as an excuse for not wanting to upgrade to Windows Vista. Another example of an advantage to UAC is that you can create standard user accounts for your children. By providing your children with standard user accounts, you will be able to control granting permission for them to install software on the computer. Charlene Shepard is a writer on the Windows user assistance team at Microsoft, specializing in Windows security and networking. She has prepared an excellent Windows Help article on User Account Control, Understanding User Account Control in Windows Vista. For locating at a later date, the article has, of course, been added to Windows Vista Bookmarks. Look under Features and Tutorials. Earlier this month, I wrote that Ad-Aware 2007 is not Windows Vista compatible. 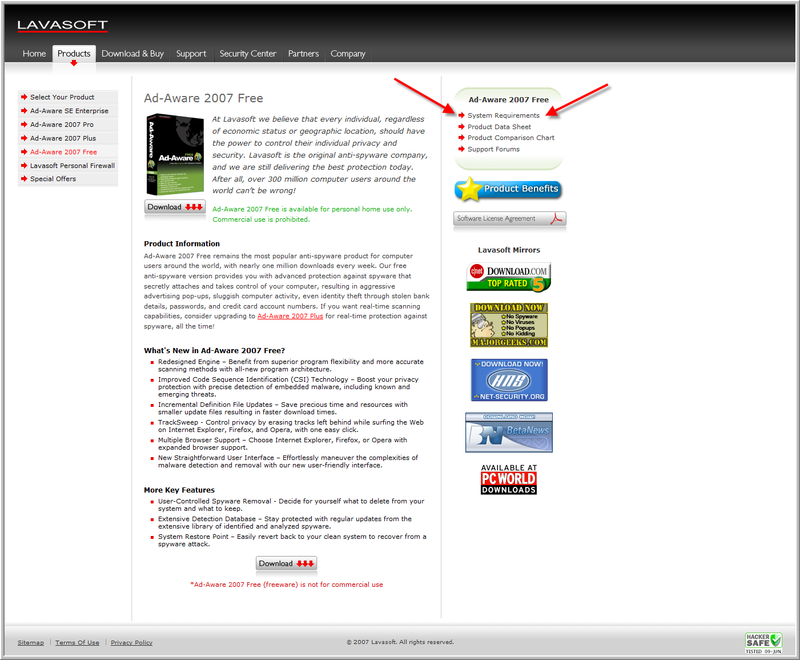 Based on some of the posts in the Lavasoft and other forums, I can certainly see why Ad-Aware 2007 has not earned Vista certification. Had the many people who have had serious problems with their computer paid attention to that lack of certification, perhaps there would be significantly fewer cases of Windows Vista users having suffered major problems with their computers after installing the software. So, what does it mean to be certified for Windows Vista? How does a person know if a software they wish to install is compatible with Windows Vista? Ben Reed, a Manager in the Windows Vista Team, recorded a video to answer those questions and to illustrate the simplicity of installing software that is Certified for Windows Vista. There are four key areas where certified applications shine. They include: security, reliability, performance and compatibility. Security -- The applications meet privacy standards set forth by the Anti-Spyware Coalition. They are fully tested to ensure they do not contain any spyware or malware. The applications fully integrate with Windows Vista User Account Control (UAC), meaning the applications no longer need admin rights to run. Performance -- Certified applications integrate with Windows error reports, making trouble-shooting the software, and improving the long-term user experience with the software. Reliability -- The software supports the MSI package for installing reliably and cleanly, reducing the necessity for unnecessary reboots. Compatibility -- The software must past tests for compatibility with both Windows Vista 32 and 64 bit. The areas above are just a part of the testing for a software to be determined Certified for Windows Vista. All in all there are 32 tests conducted by third party companies and over 800 software programs that have achieved the requisite standards. Watch the video as Ben demonstrates the simplicity of installing a software certified for Windows Vista. Look for the Logo. Experience the Difference. Jeff Jones is a Security Strategy Director in Microsoft's Trustworthy Computing group. As reported in the Windows Vista Team Blog, Jeff has prepared a comparison of vulnerabilities discovered in Windows Vista versus other operating systems in their first 6 months of availability. The report is available in PDF format from Windows Vista - 6 Month Vulnerability Report. For parents of young children, there is a Firefox extension that adds a parental control system to the browser. Its called Glubble and can be set to suit the reading ability of your child. Yet, the Firefox interface is unchanged. An important feature for parents to know is that the "Glubble Altered Search" has the Google and Yahoo search engines show results from children's trusted Glubbleword rather than the web. This feature will help your child avoid potentially dangerous sites/images resulting from a typo. Do you have questions about security your computer? Online safety? Malware? Phishing? If that is the case, join the Microsoft Security MVPs in a question and answer chat in the Microsoft TechNet Chat Room on Thursday, June 21, 2007. We invite you to attend an Q&A with the Microsoft Security MVPs. In this chat the MVP experts will answer your questions regarding online safety issues such as phishing, spyware, rootkits as well as server related topics. If you have questions on how to protect your PC, please bring them to this informative chat. Although Windows Live Mail will be superseding Windows Mail on Windows Vista, it is still delivered as part of the operating system. Perhaps that will change after Windows Live Mail is out of beta . . . or not. Either way, Vista4Beginners put together a number of help topics for Windows Mail. You can find them bookmarked in Windows Mail & Calendar. Although I have been occupied with other things of late, I have continued to both seek new sites with helpful information for Windows Vista users as well as useful tutorials. The latest additions to the Windows Vista tutorials provided by Vista4Beginners encompass Instant Search and have been bookmarked . You can return to those tutorials in the Search section of Features and Tutorials. A new find is SimpleHelp. I learned about it from a friend at LandzDown Forum. This friend provides remote help for family members and found the Screenshot Simulations at SimpleHelp invaluable. I contacted Ross McKillop, webmaster and tutorial writer at SimpleHelp and suggested several tutorials for Windows Vista. His response was almost immediate and the tutorials have started to appear, beginning with this Windows Vista firewall tutorial, added to Vista Security Features. Watch for more bookmarks coming from these two excellent sites, Vista4Beginners and SimpleHelp. June's release contains 6 new bulletins, 4 of which have maximum severities of "Critical". Please refer to the bulletin revision notes for more detail. No words can express how deeply I will miss my friend, Patrick M. Fowler, known online as Canuk. I tried to call you today. The phone just rang and rang and rang. I didn't even get the answer machine. Then I heard from your sister . 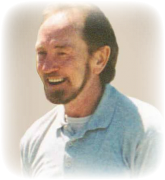 . .
Moving Forward: "The Julie Group"
While the nightmare that Julie Amero and her family have endured over the past three years may soon be drawing to a close, like all nightmares, there will likely be flashbacks. As we wait for the State of Connecticut to make a final determination on whether they will pursue a new trial for Julie, efforts are under way for Making sure what happened to Julie...doesn't happen again. "How many of you working for corporations have been to mandatory sexual harassment training every year? But how many of you have been to a company security training?" Both are mandatory training requirements where I work. However, I am in a corporate environment that not only emphasizes strong employee values but also has a solid backbone supporting the corporate network. While such efforts may be in place in large corporate environments, smaller companies, including school systems, as well as places with rapid employee turnover most likely do not have the same resources. "Education will be a big subject. Preventative computing practices that minimize exposure to inappropriate content will be endorsed. Educational materials for use in schools will be examined and recommended. Lawyers looking to offer pro bono services might drop in to see what we're up to and recommending as worthy causes. Police and enforcement agencies will find the Julie Group receptive to offering independent second opinions of cyber-crime cases." There is a world of ignorance surrounding the enigma referred to as "the 'net". Laws are archiac or too broad when considering the effects of expired antivirus software, an infected email attachment, a drive-by download, or a mirad of other events that could infect a computer of an unsuspecting computer user. If you or someone you know know has been impacted similarly to Julie Amero, refer them to The Julie Group. Very accurate and script-kiddie-friendly exploits are publicly available for both vulnerablities. It is possible that crimeware distributors will start exploiting this for drive-by downloads. Therefore, please install the latest upgraded version of Yahoo Messenger (ver 8.1.0.401) as soon as possible. Yahoo will start distributing the new version soon through an automatic update, but until that happens, you will need to install the new version manually by going to the Yahoo Messenger download page. Don't wait for Yahoo to make the fix available via their automatic update process. Instead, update Yahoo Messenger as soon as possible. Ad-Aware 2007 has not been certified for Windows Vista. In fact, Lavasoft "discovered a technical glitch required for Ad-Aware 2007 to fully operate with Vista." * Is independently tested for compatibility, functionality and reliability on Windows Vista-based PC's. * Provides enhanced security by implementing Microsoft security guidelines. * Meets privacy standards set forth by the Anti-Spyware Coalition. * Installs reliably and if necessary, uninstalls cleanly. * Ensures compatibility with 32-bit and 64-bit editions of Windows Vista. See Microsoft Knowledge Base Article 933305 for Applications that have earned the "Certified for Windows Vista" logo or the "Works with Windows Vista" logo. Look under "More Information". Ad-Aware Plus and Pro users are reminded to be vigilent with Ad-Watch. See Ad-Watch Setting Can Kill .LNK and .EXE File Extensions. This topic has received quite a few hits since August 28, 2007, when Lavasoft published their blog post, Ad-Aware Now Vista Compatible, (including the Works with Windows Vista logo shown here) and the subsequent forum announcement on September 3. When following the referral links to this topic, they all seem to go to various sites where users with Windows Vista are having problems with Ad-Aware 2007. Thus, in conjunction with the above-linked announcements, the purpose of this edit note is to supply this updated information provided by Lavasoft so an informed decision can be made by Ad-Aware users. I will leave it to you to read between the lines. Gothenburg,Sweden, August28 – Pioneer anti-spyware company Lavasoft today announced the release of the Microsoft VistaTM compatible version of Ad-Aware 2007. In July, Microsoft COO Kevin Turner announced that Vista had already sold 60 million copies since the launch at the end of January 2007.This latest version of Ad-Aware provides compatibility for VistaTM (32 bit). To ensure that the product was compatible without relying solely on the self-interpretation of ‘works with Windows VistaTM’, developers at Lavasoft took advantage of the Vista-Ready program offered at the Microsoft headquarters. The Vista version is available to existing customers through the web update program within Ad-Aware 2007. New customers can visit www.lavasoft.com for more information. For further information, please contact Michael Helander, Director of PR & Communications at Lavasoft, telephone +46 733 18 45 63 or atpress@lavasoft.com. “We have opened up important lines of communication with Microsoft, and have established the next steps that need to be taken in order to ensure a Vista compatible version early this fall,” says Odd Stranne, project leader and software developer at Lavasoft. immediately receive the Vista compatible update when it is available. October 22, 2007: Anything missing from the Winqual Application List: Works with Windows Vista website (site requires IE to work)? "Recently we released two images in virtual formats of Windows Vista which will give you a 30 days hands-on experience to play with both a Windows Vista 30-Day Enterprise Edition and Windows Vista with Visual Studio 2005 . Using the power of virtual machines, you can download these Virtual Hard Disks (VHDs) and play with Windows Vista and other apps right away. This means you have minimal set up with no additional hardware required. Once the VHD is downloaded you can test drive right away. All you need is a tool like Virtual PC 2007 which is a new, free product from Microsoft used to set up virtual machines quickly on your desktop. The VHDs are located at www.microsoft.com/vhd. Also stay tuned for more images with both MS products and partner apps. Check it out and see what you can do with it! Also, to get your hands further into test driving Windows Vista check out Virtual Labs and Windows Vista Test Drive. Both use similar virtualization technologies but work within an online environment. Stay posted for more TechEd 2007 news!" If you are not sure about Windows Vista this is a great way to try it out. On Tuesday 12 June 2007 Microsoft is planning to release six new security bulletins. At this time, four are expected to be rated critical, one important, and one moderate. There will be updates for Windows Vista and IE7. See "Affected Software" in the Bulletin for further information. Note that the bulletin advance notification will be replaced with the June bulletin summary on June 12, 2007. For more information about the bulletin advance notification service, see Microsoft Security Bulletin Advance Notification. Microsoft will host a webcast to address customer questions on these bulletins on Wednesday, June 13, 2007, at 11:00 AM Pacific Time (US & Canada). For more information, see Microsoft Security Bulletin Summaries and webcasts. Microsoft also provides information to help customers prioritize monthly security updates with any non-security, high-priority updates that are being released on the same day as the monthly security updates. Please see the section, "Other Information" in the Advance Notice. "Julie Amero leaves the New London courthouse this morning escorted by her husband, Wes Volle, left, and Todd Fernow, the head of the Legal Clinic at the University of Connecticut Law School." Today Superior Court Judge Hillary B. Strackbein overturned the conviction of Julie Amero on four counts of risk of injury to a minor resulting from pornographic pop-ups appearing on a classroom computer. Judge Strackbein ruled that the expert computer witness presented by the prosecution, provided "erroneous" testimony about the classroom computer. "state would take no position on Dow's motion for a new trial, making it unlikely she will be tried again. Smith also acknowledged that erroneous information about the computer was presented during trial." I sincerely hope that if the State of Connecticut does indeed determine that a new trial is unnecessary, the decision is made quickly. I also hope that other schools and public facilities providing internet access have learned a lesson about proper computer maintenance from this case that has dearly cost Julie Amero and her family. This event was a testament to the power of a community of people coming together in a common cause. After being rescheduled several times since March and most recently a change in venue, Julie Amero is scheduled to be sentenced tomorrow. However, prior to sentencing, Judge Hillary Strackbein is expected to rule on a motion filed today for a new trial. "Amero’s attorney, William Dow III, based today’s motion for a new trial on “evidence discovered after the verdicts and now in possession of the state and the defense.” In light of the new evidence, Dow said the jury reached inaccurate conclusions about Amero’s alleged Web surfing." For the sake of the peace of mind for Julie and her family, I certainly hope this can be settled soon. Click the Amero tag for background information and links. Many of you realize that my Windows Vista Bookmarks Blog is mirrored at Windows Connected (Connected to Vista Bookmarks). This week, two fellow bloggers from Windows Connected are taking in the sights, sounds and stash at TechEd 2007 in Orlando. "The latest piece of garbage floating around Myspace - full writeup here - is bad enough. Fake Windows update box overlaid on random profiles, that takes you to a hijack involving rogue antispyware cleaners." MySpace seems to be a magnet for bad behavior. Please use caution. Not long ago I wrote about the new Kodak EASYSHARE Printers, particularly the Kodak EasyShare 5300 All-in-One Printer that I saw demonstrated. I had been having problems with the old deskjet printer I got when I bought the Windows 95 machine quite some years ago. So, now that I have a new laptop with Windows Vista Ultimate I took advantage of a recent opportunity last Friday morning and placed an order for the EasyShare 5300. Of all things, the printer has already been delivered! I am impressed. That was darn fast processing. Since I still have some reorganizing to do with my home computer desk as well as more files to transfer to the new laptop, I decided to hold off installing the printer until those jobs are done (or at least until the weekend). However, I couldn't resist a peek inside the box. I have to tell you, that is the best packaging I have seen to date. Right on top is a simple illustrated instruction booklet with large lettering, "START HERE". The package contents are listed first with instructions for unpacking and setting up the printer. The instructions are very clearly written and very straight forward. I am looking forward to setting up the printer for another reason. Having achieved a milestone at Kodak, I received a certificate for the "Company Store". Now I have an EASYSHARE V610 Dual Lens Digital Camera. With the extra memory card I purchased, I will be able to crop and print pictures on my new printer. It seems that I have finally made it to the digital age!